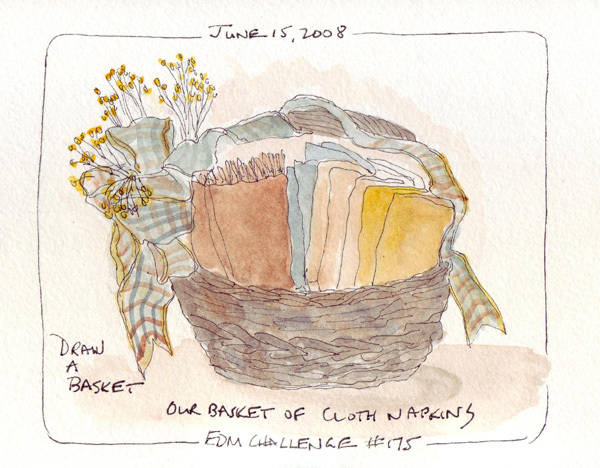 A basket of cloth napkins that we keep on a shelf under our side table in the dining room. I like your basket. The picture is a nice composition and you did a good job depicting it. I haven't done a basket yet. I am new enough I am going to be starting with challenge number one so I can work up to a basket! LOL. fabulous subtle shading on this wicker - and the bow is amazing, very soft and natural ~! It's very nice. The colors are beautiful, it all seems very real! your sketches of late are all beautiful, with your typical touch and I adore this basket. It has a lot of...life in it!